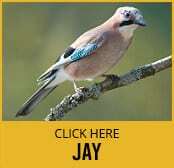 The Jay or garrulus glandarius is listed under the Wildlife and Countryside Act 1981 as a pest bird for several reasons. One, they bury nuts and acorns which can lead to other pest animals because ground rodents, and more, may be attracted to the food burial sites. Two, they will bully smaller birds away from the feeders and scatter the seed they do not want all over the ground which can attract other pests as well go rotten and potentially ruin part of your garden. Three, the large amounts of droppings are a source of disease for people and other animals. Said to be the most colourful members of the crow family, the Jay is generally a shy bird which likes to remain under the cover of bushes and trees. Known for their horrible screaming call, it is while making the sound that you may see one fly from one tree or cover area to another. It is important when you have a nuisance bird disturbing your home or business that it is dealt with professionally in accordance with all applicable local laws for removal, deterrent and relocation as necessary. Dealing with them on your own is not a good idea – we have the appropriate trapping and disposal equipment to do the job right and in accordance with local and national regulations. Get the professionals.